There is something entirely soothing about getting out the bowls, whisks, and spatulas to mix up a simple batch of muffins. This is what I needed to get my small batch of chocolate chip muffins going. "Plain" vanilla chocolate chip muffins can look a little anemic on top so the sparking sugar is a nice little topping. I sometimes go with turbinado sugar; this time I went with sparkly sanding sugar. I used Ghirardelli semisweet chocolate chips instead of chopping up some chocolate for these muffins. Grabbing some chocolate chips from the bag just makes the whole process quick and easy. Use a brand of chocolate chips you love and it'll be hard not to enjoy these muffins. In about 15 minutes or so in the oven, they're ready to go! This is a nice back-pocket muffin recipe I'll be making again. Update: I also used this recipe base for blueberry muffins. Simply omit the chocolate chips and stir in about 1 1/2 cups of fresh blueberries instead. You could also add a teaspoon or so of fresh lemon zest for that classic flavor combination. Preheat oven to 375 degrees. Line a standard 12-cup muffin tin with paper liners. In a large bowl, whisk together the flour, baking powder, baking soda, and salt. In another bowl or large measuring cup, whisk the milk, oil, butter, sugar, eggs, and vanilla together. Add the wet ingredients into the dry, stirring with a rubber spatula until just moist. Add chocolate chips and gently stir to combine. Spoon or scoop the batter into the 12 muffin cups. Sprinkle the tops with sparkling sugar. Bake for 15-17 minutes, or until a toothpick inserted into the center of a muffin comes out clean. Set muffin tin on a wire rack to cool for a few minutes before removing muffins and allowing to cool to room temperature. I love all your muffin recipes, Monica and this one is no exception. 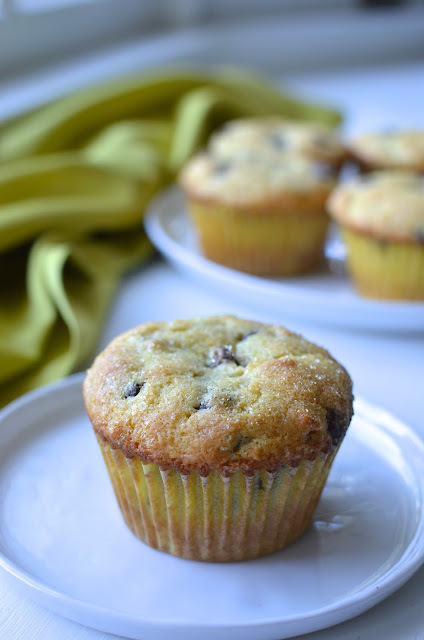 Love this easy peasy and super delicious muffin recipe. These would make a perfect weekend treat for my chocolate loving family. Easy peasy are definitely the recipes I fall back on. Thanks, Anu. They would make a perfect weekend breakfast! I love these muffins! Bakery style or not (I always think of giant, crumble topped muffins as bakery style) these look wonderful. Cake in the morning is always a good idea - especially on the weekends. Chocolate chips? Yes please! These are lovely Monica and I love the little sprinkle of sugar on top. I made pear muffins recently (posting soon) and one of my favorite parts was the crusty, sugared top. Yummy stuff. Thanks for sharing this keeper! I see the bakery muffins the same way - big, crusty, maybe crumb-topped or just really sturdy and browned. : ) I love the sound of your pear muffins and that sugary crust. I will keep an eye out for it! These muffins look delicious, love that they are not too complicated. I feel the same way about chopping veggies, it is very relaxing. Have a wonderful week-end Monica. There can never be too many muffin recipes especially if they look this yummy! Love the sanding sugar topping! So perfect for breakfast or an afternoon snack! Yes, so easy to make, too. Great back pocket muffin recipe to have when I need some quick. Enjoy the weekend, Kelly. These muffins look absolutely perfect! Thanks; they're easy to make and go quick. This does look like a great recipe to have as a "back pocket", such a classic! Love your baking! Would love one with a hot cuppa in the am or just in the afternoon for the kids after school- perfect. I like having one at night for dessert, too. Thank you, Bobbi!